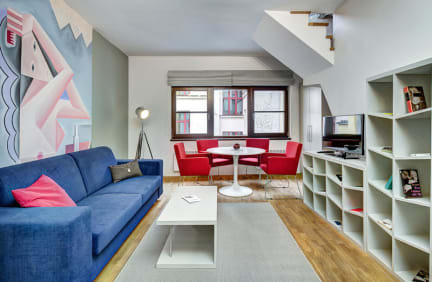 4 Arts Suites is unique residence opened in March 2015 and offers 15 themed apartments unusually describing the most famous Prague musicians, artists and writers. 4 Arts Suites enjoys a central Prague location. 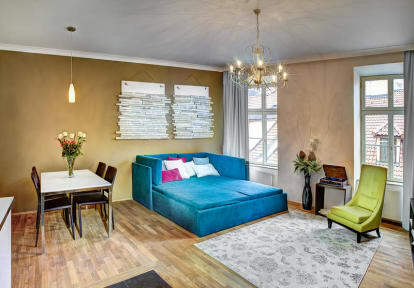 It offers original apartments inspired by artists who used to live in Prague. The residence is located just few steps away from Old Town Square, the Municipal House is directly round the corner. There are many high quality restaurants and bars in the neighborhood, Palladium shopping center is just 200 meters away, Parizska street offering luxurious shopping is a 5 minute walk away. All apartments have spacious bathrooms with shower and Loccittane products, comfortable beds with big pillows and fully equipped kitchens. Free WI-FI is available in all apartments as well as satellite hotel TV.